The Mysterious Benedict Society and the Prisoner's Dilemma & an AWESOME Giveaway! So here's what happened. I had every intention of reading this book THE DAY of its release. Only Bookworm1 got sick and I forgot *gasp* about the release date and then yesterday Dawn, (BLESS HER!!! ), e-mailed me to ask me if I had picked up a copy because I had raved to her that I was going to do so. I saw her e-mail, picked up Bookworm1, stuck him in the car and hightailed it to the bookstore. (I have never done this before, if you were wondering.) Thankfully she sent the e-mail right before nap time so I came home, tucked Bookworm1 in and sank down on the couch to read and read and read. Once again the four children are engaged in a battle between good and evil. Once again I love this book for the clear distinction between what is right and what is wrong. In this book the children's skills at deduction and giftings are put into play to ultimately save the day. (That's really not a spoiler. This series is very certain about good being good and evil being evil.) Once again the children are "in the know" about the evil that Mr. Curtain would love to unleash upon the planet while the rest of the unsuspecting population is going about their daily lives. If the children had not stuck together and worked together, they might not have met with success in their endeavors. By reasoning together, putting other people's pleasure, comfort and safety above their own, they made it through as a unit. That flies in the face of modern thought. We do not typically find ourselves safe in crowds of people - no matter who those people are and how much we might like them! Even the Army is peddling a new slogan about being an 'Army of One' but that's bogus! We need people. We need to be a part of a community. We need fellowship and accountability and this book highlighted that need in an adventurous and clever way, for which I have a great deal of appreciation. This "simple" statement emphasizes the fact that we need to be individuals of thought and discernment, not willing just to accept whatever is spoon fed to us by any number of individuals, corporations, even, er, Christian organizations. We need to be people of moral integrity, always searching for what is true. As a Christian, I believe the best source of truth is the Word of God. So then it follows that I should be comparing the things I hear/read/see/think/do in light of scripture, that being my ultimate authority. How do the two messages simultaneously work together? Be a team! Be thoughtful towards your own behavior! Good thought and good company somehow seem wrapped up in each other. Ironically, these two messages are ones that I am grappling with in my own life. I do not think I just pulled these messages from the book out of the hat though. They are clearly some of the main points of this work. We need each other. We also need to be searching for truth. Sometimes that means taking a stand for one's self. And other times we find the most safety in a multitude of counselors. It's a curious balance. 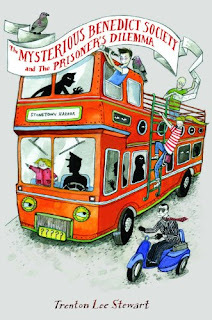 And The Prisoner's Dilemma , my friends, is an awesome conclusion to the Mysterious Benedict Society series, providing its own curious balance and satisfying every reader's desire for entertainment and a good deal of thought. My other copies of these books are both paperback editions but since I rushed out to buy a hardback, I feel the need to replace the first two with hardbacks also. Not that I mind and it's probably a wise thing to do because I intend to love these books fiercely with my children as we all grow up together. Contest will be open until Saturday, October 17th. If you have not yet read The Mysterious Benedict Society, this would be an excellent opportunity to correct the situation. I am beside myself with excitement. A chance to own a complete set? I adore these books, but I've only gotten them at the library. I would LOVE to win a copy. THIS WOULD BE AWESOME! I love these books! I also checked them out at the library. I think they would be a great addition to my collection that I've started for my children. I have a 10 month old and another on the way. I am also a regular subscriber. Yes, please!!!!! I have yet to read these books and would love them. Ooh, ooh! I've had this series on my wish list for ages now! I'd love to win. Wow - what a great giveaway! I loved the first two but haven't picked the third up yet. You are right that they are both fun and such a good moral lesson. I kind of thought of them as Harriet the Spy mixed with Roald Dahl and perhaps a touch of CS Lewis! And I subscribe through Google Reader. We set aside school for an hour to be run to snag a copy hot off the presses. We could use a second set in our home! YAY! I finished the first book not that long ago. I do subscribe to your blog. I would love to win these books. Didn't know about the titles until I read your review. Please pick me. :) And seriously, what a great giveaway! Oh, oh, oh, oh, oh, oh, oh MY GOODNESS!!! Just found your blog while looking for reviews on Don't Make Me Count to 3 and Wise Words for Mom. I've enjoyed reading back (for way too long on my laptop!) and look forward to following your blog. I've never heard of this series and am always looking for new authors to read. Thanks! These look like really fun books. I'd love to win them . thanks. I am a regular subscriber also. Thanks. We just recently read The Mysterious Benedict Society and had no idea there was a Book 2 and now a Book 3!!! My children (and husband) are going to be thrilled. What an exciting giveaway, indeed! Please count me in! Really though, I feel incredibly pretentious being all "I'm a regular subscriber - give me a gold star." I am always looking for great books to read to my kids and this series sounds like just the kind of reading I do with the children. And great review, by the way! I am also now following your blog. I'm definitely interested in children's books to read to kids I know. Please enter me. Oh, yes! I can't wait to read this one. THERE IS ANOTHER BOOK???? AAAAAAAAAAAAGGGGGGGGGGGGGGGGGGHHHHHHHHHH! I do not own it yet? As usual, thank you for the review and for the booklist updates! I too, would love to own the whole series as (SIGH) I have yet to own the second book. SIGH! I'm a subscriber...I LOVE these books. I talk about them to everyone I know! I would love to win them for my kids. I think I am what you would refer to as a regular subscriber. I am also a homeschool teacher of 11 childern (not all my own). Your mom introduced me to the series. I would love to get the whole set! Wow! Great giveaway. My son read the first book from the library, but I haven't been able to read them yet. He loved it! It was the first book he read that he didn't want to put down. Havent read any of them but would love to! Oh my...how awesome! I've been wanting to read these, and then donate them to my friend's low-level high school English class. Though if I like it as much as you, I might keep 'em and buy another set for the kids! My boys would love a series full of adventure like this one. Please put me in the drawing. Thanks. I haven't read this yet, but they sound perfect for my boys. I'd love to be entered!! And I'm a regular subscriber (you know it). My oldest son would LOVE these. Thanks for sharing. Regular ready here! I really enjoy your blog and your reviews really help me in picking out good reads from my two kiddos! Hope to add The MBS to our library! I love to read aloud to my kids and these books sound awesome for that! Thank you for the chance to win!!!! These books sound wonderful! I would love to give them to my granddaughters! Thank you for the giveaway! These books look great! I would love to win a set. thanks for offering! My kids are hooked already! Please enter us in the drawing to win the set. Oh, more drama, more surprises...and pages turning themselves? Oh boy!